I see the pre-pub pricing on this ends tomorrow. Am I the only one that thinks $300 bucks is a little over the top? Just curious. Out of my price range in any case. In my opinion - and it is admittedly biased as Magicana is publishing the book - the list price is a bargain. (Even better with our prepublication offer.) It all depends on how you look it. (It would also be helpful if you reserved judgement until you had actually seen the book.) Either way, you are probably comparing it to the price you pay for rank and file magic books rather than the inside information developed over the course of seven decades, explained in great detail, with every nuance and touch imaginable, from one of magic's most esteemed performers and consultants. Or put another way, three hundred bucks probably wouldn't buy you an hour of Johnny's time as a consultant, and here you have it all. I also understand, however, that everyone has to make choices, particularly in economically challenging times. I look at it similarly to Caveney's magnum opus. This represents an entire career's work of one of the best of all time, IMHO. Just my two cents--it is expensive for a non-essential life purchase. However, I believe it will be a terrific book, and will be worth it to the purchaser who actually studies it and puts its lessons into play. erdnasephile wrote: (I, of course, haven't seen the actual books, but knowing the principals involved--I think it's a safe bet). I have seen the books (or at least, I've seen proof pages). This is as near a no-brainer as a $250 magic book can be. When I look at the other Magicana books I have, every one of them is well worth the purchase price. I see no reason at all to think this one will be any different. I'm buying it! Can't imagine who wouldn't. I’ve ordered a copy and am very much looking forward to receiving it - Magicana always produce a top quality product. I do agree that the book is an expensive purchase and recall that another publisher once offered a ‘lay-away’ deal whereby the purchaser could make part payments via PayPal for, say, 3 months and receive the book once the full amount had been paid. I’m conscious this arrangement likely added a bit of ‘admin’ to the process however no doubt it helped those who were unable to pay the full amount up front and also generated a few more sales. To a working pro, it is tax deductible. To the sincere student of magic it is a book to be refereed to again and again. To those who have their wits about them, will leave this page open and highlighted so their nearest and dearest will know what to get them for Christmas. I've been sitting on the fence since Magicana announced the book and I haven't ordered it yet. I'm sure the book will be excellent, quality-wise, and that the material may be useful and perhaps even reveal "the secret" (the great secret of magic that turns the possessor into the greatest magician in the world), but do I need it? Last edited by Marco Pusterla on October 30th, 2017, 4:51 pm, edited 1 time in total. I've had the pleasure of reviewing some of the material that's near and dear to my heart (fishing for cards) and there is a lot to learn from here. I've also had the pleasure of seeing Johnny perform for real people on several occasions and he killed every time. Books like this are invaluable, even if you don't use one trick in the book: you get to see inside a master's trick brain. There seem to be a lot of books on the market that consist of some guy's version of some other guy's trick. I've saved a lot of money by not buying those. Follow my lead and you'll soon have saved enough to buy Johnny's book. Bob Farmer wrote: ...Follow my lead and you'll soon have saved enough to buy Johnny's book. And I think that's a great point. We all have lots of dreck on the shelves that are another person's treasure. Being willing to part with some junk we never use may be the key to affording the stuff we will. Avoiding the junk in the first place (as Mr. Farmer suggests) makes things even easier. In addition, big books like these typically are announced months, sometimes years (and sometimes lots of years) in advance. If that book is of heavy interest, it becomes relatively easy to put some money aside for it in the months prior to the release. With the book at hand, I doubt it will sell out immediately--it's not a limited edition and the price point limits the market. If one started saving $2 a day now, in half a year, they'd have it. Moreover, if they can be patient, it's likely they'll see it for sale second hand for less on the Green site or on ebay a couple of years from now. All that said: one doesn't "need" it (or any book/prop) to be a great magician, nor is it not a luxury purchase--and, of course, it should not come before the necessities of life and financial well-being. However, I'll bet it'll be great. PS: I like Q's Christmas idea as well. Better yet: offer 6 relatives the prospect of combined Christmas and birthday presents. That's 12 presents at $25 per gift, and they knock you out in one fell swoop! Either that, or there's always GoFundMe. The book has everything. Everything that was possible to describe. And although you describe previously released material as "already mature", that was, in fact, not the case. Johnny, like Vernon, constantly reviewed, simplified, improved his material. And like Vernon, somethings that were either filmed, published or released earlier, may not have been the exact way the material was meant to be performed. Vernon's Triumph and Cutting the Aces are perfect examples. They may have been simplified for general consumption rather than presented with the requisite finesse or sleights that really made them sing. In the case of Johnny's book, to take just one of many examples, the description of the Cups and Balls has many unpublished handlings, and two previously unpublished endings. Both fantastic. The description of the Sugar Cube Assembly, is so full of nuance, with details on how different hand movements are used at different times to facilitate different palming techniques - drawing on the work of Malini, Miller, Fred Kaps and, of course, Johnny's own experimentation, that nothing is left to chance. It's all there. Also, for those interested in the history of sleight-of-hand in the twentieth century, there is much to learn from this work. One of the challenges in presenting this material was organizational. How do you parcel out the material? I suggested, and it has been adopted by and large, that we approach the Thompson book like a circular shopping mall with various anchor tenants. You can enter the mall - the book - at various points and work your way around it. You will see the large anchor tenants - the Cups and Balls, the Balls in the Net, The Egg Bag, The Trade Show Act, the Bird Act, etc - interspaced with more specialty shops - the work of Harry Riser, Marlo, Zarrow, Miller, Malini, Coin Work, Colour Changing Knives, Illusions to name just a few. If you ever wanted to perform Metamorphosis, I can't think of a better way to do it than as described in this book. I am tempted to mount a new show just so I can add Johnny's staging of this trick to it. And speaking of illusions, Julie Eng and I just finished working on a new film by Daniel Zuckerbrot, and we were able to stage one of Johnny's illusions in the film. It was spectacular. We would never have been able to do it without Johnny's previously unpublished routine as the starting point. So, it really is a magnum opus, and it is supported by more images than I imagine have appeared in any single publication in the history of magic. Over twelve years in the making and I now know why. Soon, you will too. David Ben wrote: ... it is supported by more images than I imagine have appeared in any single publication in the history of magic. "The Magical World of Slydini" by Fulves has more than 1300 photos. "Andrus Card Control" has more than 1000 illustrations. If the Thompson book has more than those then congratulations! Julie has shot over 3,000 images for the book. Still, having taken Mark’s commentary into account, we should still exceed the mark set by Slydini in the final product. I have been a close friend of Johnny Thompson’s for many years. For the past three years, I have had the privilege and honor to spend many hours talking and working with Johnny during the preparatory months leading up to the Fool Us shoot and the two weeks of the actual shoot. During that time I have been constantly astonished by the depth of Johnny’s knowledge on all aspects of conjuring and his ability to refine handlings to make them more natural and more magical. For me, this has been a priceless learning experience. Forty-three years ago, I learned an impromptu card effect of Johnny’s that I have intentionally kept away from magicians. It’s just too good. It’s in the new book. I’m not going to tell you what it is, and if we meet, I’m not going to show it to you. It’s that good. One-trick, POS DVDs are selling for thirty bucks. You easily have ten of them in your magic junk drawer. Johnny’s book is the culmination of a lifetime in magic by one of the greatest performers (close-up, stand-up, and stage) of the twentieth and twenty-first centuries. I’ve seen some of the galleys – this will be a gorgeous set of books. Is the price too high? I don’t think so. I just divided $300 by a lifetime and it comes out to be pretty inexpensive. I understand that everyone has economic restraints. But this purchase seems like a no-brainer. I bought a copy. Just thought you might like the opinion of someone who knows the man and who is familiar with the material. Michael Close wrote: Just thought you might like the opinion of someone who knows the man and who is familiar with the material. When someone writes a book, the opinion of their close friends is always helpful. Was that sarcasm? Hard to tell! I wrote a book once and some silly magic woman said "are you insane? That is FAR too expensive!" It was only $25 and is still selling steadily. Yes, the Thompson Trick - really a reworking of a great piece with many great touches (all credited) - is in the book, and Mike fooled me with it when he and I first met in the early 80s. It only took 35 years for me to learn the handling (from Johnny’s book) as Mike never tipped it. And the great thing is that, although Mike (and Johnny) have great chops, this piece depends more on subtlety than sleights, all of which have been recorded meticulously. Such a great trick. I know that "worth" of a non-essential item is a personal (and sometimes sensitive) subject. I don't feel I'm in a position to judge anyone's feelings in this regard, and can only speak for myself. At the risk of offending, for me, it feels right that this material should be priced at a point that is reflective of the esteem with which it is held by those in the know. Mr. Thompson is a first generation living conduit to the masters: Riser, Miller, Vernon, Judah, etc. Those folks are sadly becoming in short supply these days, and they typically don't tip to just anyone. (Indeed, when it comes to his original material, I think Mr. Thompson only has about 3 or 4 pamphlets in print.) The notion that at long last we are being given a chance to access secrets that others would have killed for back in the day is a pleasing one because there was a time where this type of information couldn't be had at any price. PS: I'm grateful for and appreciate Mr. Close's perspective--he's seen more magic products than I'll ever see in my lifetime, and he's had lots of practice being objective about the products of friends (which has sometimes turned them into ex-friends). One thing I learned during his tenure as a reviewer: if he says it's a must buy, for me, it is. Last edited by erdnasephile on November 1st, 2017, 4:51 pm, edited 1 time in total. At this point in time there are no plans to do a special signing in advance. It would be a logistical nightmare with Johnny operating out of Vegas, the books printed in Canada, and the fulfillment house in another state. To compound the issue the books will be large, and we plan on adding extra packing to ensure they are not damaged in shipping. So, opening up books, signing, repacking is just not in the cards. We also elected not to do a Collector’s Edition for much the same reason. Instead, we are trying to make each set have most of the attributes of a Collector’s edition, all except the signature. The other good news is that Johnny seems to be traveling a great deal, both in the States, and soon abroad, so the chances are you might be able to get him to sign them for you. 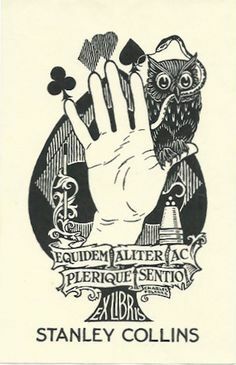 I have seen many beautiful magic related book plates over the years, none would I call a gummed label, but tiny works of art. One could be created for such a worthy subject as this and would be even more icing on the cake so to speak. I for one would love to have this as part of the package and it would not even need to be attached just added to the inside of the box before sealing. My order is in place either way. Great idea I think. "The greater number, otherwise I feel that, indeed,"
Oh well, the Genii Convention put a big enough dent into my "magic budget" to be able to get in on the pre-publication offer. Joe Naud wrote: I have seen many beautiful magic related book plates over the years, none would I call a gummed label, but tiny works of art. One could be created for such a worthy subject as this and would be even more icing on the cake so to speak. I for one would love to have this as part of the package and it would not even need to be attached just added to the inside of the box before sealing. A few years ago, Ron Graham and Persi Diaconis wrote a book on mathematical card tricks. The publisher attended the Gathering for Gardner that year, with copies of the book for sale. Graham is a regular attendee. Diaconis, on the other hand, only came to one or two of the very early ones, when Gardner himself would attend. It was easy enough to get a copy and get Graham to sign it, and the publisher brought (literally) gummed labels bearing Diaconis's signature. So I have a book signed by a man I've never met. The practice of having an author sign a self-adhesive bookplate, and then adhering that to the endsheet, has been common for many many years. Decades! Our deluxe edition copies of Labyrinth were done this way. And the next book I publish will also be signed by the author (every copy). Man! Now I can't wait to receive this book. Going to be a great late x-mas present to myself. My memory could be faulty here, but didn't Didn't Dai Vernon sign a bunch of sheets to be tipped into published books from L and L? The author can sign loose pages, which are then machine tipped between the first printed page and the front endsheet, or sign self-adhesive bookplates (not gummed labels). Every single deluxe edition of a book where a page is signed by the author is done using the first method. I attended a workshop that Johnny gave at the Magic Castle this fall. I left blown away by the breadth of Johnny's knowledge and expertise. [Plus, he is a great guy and was most patient, helpful and friendly with a room of magicians whose experience and interests varied broadly.] If you actually perform magic, the books will be surely more than meet your expectations. My first live experience with Johnny Thompson was at Magic Live in 2011, where he did a fantastic lecture on dove magic. Before that I only knew him as the Great Tomsoni. Even though I don’t do dove magic I was amazed by the great amount of detail and work he puts in his act. I‘m not sure if he announced the book at Magic Live in 2011 or 2013, but ever since that announcement I was sure that I must get this book, so of course I preordered it. It will be shipped in early 2018. Is it early 2018 yet? In this month's MUM, there is an fascinating article on the long process of how the books came into being. There is also a sampling of the material included as well. If the sample is any indicator, this is going to be a superlative set to study and apply. I'm really looking forward to this set! Has anyone heard anything about a ship date? It’s early 2018. Dying to read this. As of the end of January, the book, I'm told, was at the printers. which I presume is done by hand, so I'd estimate another four to six weeks at the most. Q. Kumber wrote: As of the end of January, the book, I'm told, was at the printers. Wow! Didn't know that the books were going to come with an autograph--wonderful!